Your Dad is a super hero...now he can fly like one! This Father's Day, treat Dad to the reality of flight at iFLY in Davie. As a first-time flyer, your Dad will save 50 dollars on a package for the entire family. This year give the gift the entire family will talk about for years…the gift of flight! iFLY is located off 595 in Davie. iFLY is where Dad and you can fly like superheroes on a smooth cushion of air. iFLY is safe and fun for all ages 3 to 103. 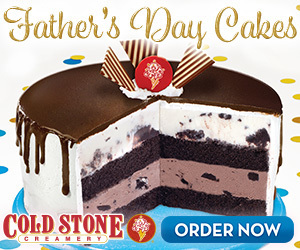 Cold Stone Creamery® will be celebrating Dad with their Tall, Dark & Delicious™ Ice Cream Cake! He'll love the layers of moist Devil's Food Cake, Sweet Cream Ice Cream with Brownies and Chocolate Ice Cream with OREO® Cookies wrapped in fluffy White Frosting and cascading Fudge Ganache. Enter below for your chance to win a Father's Day prize of a family four pack to iFly and a cake from Cold Stone Creamery®!